Good morning, everyone. I’m happy to welcome you here this morning to our 34th Annual E. F. Schumacher Lectures. 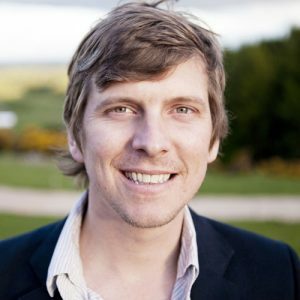 It’s my pleasure to introduce our first speaker, Matt Stinchcomb. Matt is vice-president of values and impact at Etsy, where he’s worked since the company was just beginning in 2006. His job description, he says, is to give Etsy employees the means and desire to minimize harm and maximize benefit for people and the planet. That’s a cool job if I’ve ever heard of one but also a big task. Matt’s work is dedicated to one of the trickiest aspects of the new economy, and that is scale. As we frequently remind ourselves at the Schumacher Center, E. F. Schumacher used to say, “If everyone were for small, I’d be for big.” What he meant was that it’s not a question of all big or all small but instead, as Wendell Berry put it, “a recognition of human limits and a recognition of the necessity of human scale.” Matt is involved in the issue of scale probably more than most of us. He’s been with Etsy as it has grown from a four-person business to a 600-employee business, and in fact when I came to New York in October to attend an Etsy meeting called “Reimagining Manufacturing,” Matt pulled out Kirkpatrick Sale’s book Human Scale from his bookbag. Its purpose, to the extent possible, is to bring producers and consumers, causes and effects back within the bounds of neighborhood, which is to say the effective reach of imagination, sympathy, affection, and all else that neighborhood implies.” He goes on to say: “I do not believe . . . that morality . . . is an adequate motive for good care of the land-community [he’s talking about land specifically]. The primary motive for good care and good use is always going to be affection. . . Without this informed, practical, and practiced affection, the nation and its economy will conquer and destroy the country. Matt, as we know, is not working with farming communities or food systems; he’s working in a company that provides an online marketplace for selling handmade goods. His task, which is to foster that affection which will allow for good use to give people “the means and desire” to do good, is a difficult one. I think that in his lecture he’ll probably tell us how he’s doing this. I want to recognize the courage and the creativity that Matt brings to his work and to the new economy movement. Wendell Berry has described corporate industrialism as practicing a very effective type of creative destruction. Matt seems to me to be a leader by example of the kind of creative construction that we need to build a new economy. I happen to know that his secret dream is to own a sandwich shop in Great Barrington that serves roast-beef sandwiches and whose slogan is “the beast steak sandwich you’ve ever had.” I think we can all count ourselves lucky that he’s decided to stick to New York and stick with Etsy—and that he’s here with us today. It’s an honor to be here today, not only in this building with its incredible history, which I was reading about this morning, but to be giving a Schumacher Lecture. I’m preceded by Wendell Berry, David Orr, Bill McKibben, Judy Wicks, Otto Scharmer, Gus Speth, Ivan Illich—people I consider my heroes. They have been so influential on my self-educational path, which I’m going to talk about today, that it’s intimidating to be here giving one of these lectures. It was only eight years ago that I first discovered E. F. Schumacher, and now to be on the board of this illustrious organization is hard to believe. My mom is here today, so that’s an additional level of stress, but I hope I’ll be able to impart something of value to you. I’ll begin by saying that I don’t have a traditional background in business, and I think that may have been a good thing for me, but I’ve learned a great deal just by doing. That’s what I’m going to tell you about. First, to give you some background: I’m from Washington, D.C., originally, and after graduating from Oberlin College with a degree in art history I moved to Brooklyn in 1997. When I arrived, I was entirely broke, with a ton of student debt and no clue as to what I was going to do. My first night in New York I went out to a bar, where I ran into a woman I knew from high school. Her boyfriend worked on something called a website; I knew only roughly what that meant. By way of illustration for the younger people here, in my senior year at Oberlin I took a research methods class in art history, and it didn’t involve the internet. We were told which German or Italian volumes to look at to learn what we needed to know, and oh yes, you’ll need to use the Dewey Decimal System. It all changed so quickly, and I arrived in New York in the early days of the dot-com era. I met my friend’s boyfriend on a Monday, and I got a job on Tuesday working on the internet. There was a do-it-yourself ethic and entrepreneurial spirit, and I thought that’s how business was done everywhere. It was the early years of the first dot-com boom, later bust, and no one had any formal training. I did that for three years, but I was also playing in a band during that time, which was what I’d always planned to do. I had been in bands since I was in sixth grade, and I played a lot of music at Oberlin. My band was called the French Kicks, and we spent a lot of time in a van, where we didn’t see much of the sun. In 2000 I was able to quit my day job working on the internet and do music full time. We spent five years going everywhere you can imagine, playing shows big and small. I mention this because it was my first real start-up—no money, no idea where we were heading but initiating our own business, our own creative business. We learned how to do sales, marketing, accounting, finance. As you can imagine, with all the time we spent in the van there were also difficult human-relations issues to be resolved, and this provided useful skills for me later. I also learned about merchandising, which led me to my next start-up. I began making t-shirts and posters for the band. I taught myself how to screen-print by reading online tutorials. Then other bands started liking the things I made, and all of a sudden I had a business. Now, it never occurred to me that I should be trained in order to run a business. My wife’s father is German, and he was surprised to learn that I had majored in art history but didn’t become an art historian. I hadn’t thought of pursuing that field; I just figured I’d find something to do. Becoming a screen printer was important because I learned a whole set of business skills that way, including a lot about the toxic chemicals that are used, and I tried to find alternatives. I mention this because it’s what brings me to the “maker” movement that was then nascent in Brooklyn and also brings me to Rob Kalin. Rob, my wife (my girlfriend at the time), and I were living in an apartment in Fort Green, Brooklyn. Rob was someone who did a little bit of everything. He had just graduated from New York University—which was his fifth college!—in classics, so who knew what he was planning to do, but he could take beautiful photographs, he could do woodworking, he could do all sorts of things, and that’s how Etsy came about. Like so many creative people, Rob didn’t have enough money to pay his share of the rent one month. When he went to our landlord’s office to tell him, he saw a proposal on the landlord’s desk for a website for a restaurant he owned, and it was exactly twice the amount Rob owed in rent, so he said, “I’ll make your website for half that amount of money.” The landlord said, “Sure, but where’s my rent?” Rob told him he needed to be paid for the website first. What I find so telling about this story is that Rob had never built a website in his life; he had no idea how to do it, but he saw an opportunity. That same day he got a book about HTML and went by that to build the website. Because it was a Cajun restaurant, he wanted to have animated flames on the website, but how to do that wasn’t in his book, so he posted an inquiry on an NYU bulletin board. Two programmers responded, and that was the beginning of Etsy. They became the first two programmers for Etsy. Rob was also making handmade wooden computers, and I should mention that his woodshop was also his bedroom, which was filled with sawdust. He would hide cats in there. It was a fun time. Rob sold a couple of his wooden computers to a local bagel shop, which was also a wi-fi café. He realized that there was a market for them and decided to make an E-commerce website to sell what he made. When he looked around, there was our screen-printing business, and there were creative people all around us. Everyone we knew was making things, and he said: “Wait a minute. The need I have to sell these things is a need that a lot of others have as well.” There was eBay, but eBay is not the way to go if you really care about what you’re selling because it’s like saying, “Here’s a CD I don’t want; let me put it up there.” In this case it was Rob’s own art as well, and he cared about how to present it, so rather than make a website for himself he got Chris and Heym, the two programmers from NYU, and another programmer named Jared, and together they created Etsy. I was getting out of the music business because I was tired of touring, and Rob said, “Why don’t you come and do this with me?” “But what would I do?” I asked. “I’m not a programmer.” When he said, “You can be the marketing guy,” I told him I knew nothing about marketing. “You’ll be perfect, then,” was his reply. And that’s what I did, but not in a web-savvy way. I suggested hand-screening print posters and putting them up around town, and that’s what we did. One of our posters that captures the essence of Etsy and our attitude toward business even at the very beginning shows a kid throwing a rock at a factory, and it says, “End mass production.” Even before reading Schumacher or Gandhi, who called for production by the masses, that’s what we were thinking about. There was a political element to Etsy: the self-sufficiency of doing it yourself, not buying into a system that we knew was corrupt and felt wrong to us. Starting out as the marketing person, I figured out what to do as I went along, as I did in every other job I’d had. I started reading marketing books, I started reading business books, and the more I read, the worse I felt. I wondered where the people were in all this. I learned a lot about advertising, and I thought: “What a waste of money! If we have $20,000 to spend, the least creative thing we can do with it is to spend it on one ad. Let’s try to use this money to build a community and support the artists who are selling on the site.” What I did was to travel around the world, meeting with local groups of Etsy sellers. At that time 97% of the sellers were women; now it’s about 90%. I tried to learn from the communities I visited and figure out how we could support them. It was like being on tour again but spending less time in a van. As we learned more about how best to proceed, we realized it was the community that was key to Etsy, so we created community spaces in our office called Etsy Labs for people to come in and make things. For a while we kept the screen-printing business running at the same time as Etsy because we didn’t know which one was going to pan out. If you go to Etsy in Brooklyn, you’ll see that our screen-printing press is still there. We also have a community space in Berlin called Etsy Labs. From the very beginning we were approaching the people there as our partners in this endeavor. We’re not making something for these artists; we’re making something with these artists because they are our peers and this is our community. That gives you an idea of our attitude toward business. It’s been going pretty well for us: there are now approximately 45 million members at Etsy, with about 1.2 million small businesses selling their products on the site. Last year we had transactions in nearly every country in the world. As Alice mentioned, we have around 600 employees worldwide. We have offices in Brooklyn, where our main headquarters are; we have another office in Hudson, New York, and one in Amsterdam, Paris, Berlin, London, Dublin, Melbourne, Toronto, and San Francisco. It amazes me how much the company has grown. That first year back in the second part of 2005, about $200,000 worth of goods were sold; last year it was $1.35 billion, and this year we exceeded that number months ago. What’s important to remember, though, is not these big numbers; it’s who is making the money, and that is very many people. The way I thought about Etsy started to change as it kept getting bigger. Still taking only 3½% of the sale price means that the $1.35 billion dollars last year had a meaningful economic impact in people’s lives. I realize this when I travel around the country and talk to Etsy sellers, and I also realize that business can be a tool for creating more value for the world than it takes—in this case economic, but I imagine in other ways too. You all probably know about Bill McKibben, who gave a Schumacher Lecture in 2009. I found it online before I even knew about the Schumacher Center, and I thought, “Wow, he really knows what he’s talking about.” In 2007, when we had twenty or so employees, as a company we all read the book Deep Economy by Bill McKibben. That book was an eye opener for me in showing the importance of local community economies and the role that supporting or shopping locally can play. He gave voice to how we felt about business. As a result, I started to rethink the way I should be educating myself. I didn’t want to read business and marketing books anymore; I wanted to read Bill McKibben and Satish Kumar and the others I was being introduced to or was discovering for the first time. That same year I met a woman named Linda Ligon, a pioneer in the craft movement in the U.S. in the 1970s. I was telling her about building a new model and all that we were doing. She asked if I had ever read E. F. Schumacher. When I said “Who?” she told me to read a book called Small Is Beautiful: Economics as if People Mattered. I did, and it set me on a whole new path. When Schumacher talked about evolving to a new lifestyle with new methods of production and new patterns of consumption, a lifestyle designed for permanence, it made so much sense. It represented everything that I was feeling, and I started to see the role Etsy could play in realizing his vision with our big number of small things—rather than a small number of very big things—by means of all the connected human-scale economies that were forming on Etsy. It was hard to believe that this book was written forty years ago and is still so right about everything today. That was when Etsy’s purpose started to change. At the end of 2009 I moved to Berlin with my wife to head our international expansion by opening an Etsy office there. I spent a lot of that time continuing down the path that Schumacher had set for me, reading books by Donella Meadows, Wendell Berry, Paul Hawkin, Thich Nhat Hanh, and Shunryu Suzuki; that’s how I began to get a real business education. Then I had to figure out how to apply these ideas to the business we were building. Decades of an unyielding focus on economic growth and a corporate mentality have left us ever more disconnected from nature, our communities, and the people and processes behind the objects in our lives. I think this is unethical, unsustainable, and not fun; however, with the rise of small businesses around the world I feel hope and see real opportunities—opportunities for us to measure success in new ways, to build connected community-based economies and, most importantly, by doing so to help create a more permanent future. The event was noteworthy also because Judy Wicks was there. This was the first time I met Judy, and I learned about all the work she has done, which cemented the notion in my mind that business can play a role in helping to build this new economy. There’s little doubt in my mind that giant corporations, especially those with outsized influence and political impact, are driving so much of what is troubling in the world. But Patagonia, Ben & Jerry’s, and Interface Carpet are examples of businesses that are not degenerative. In fact, business is just a tool, and it’s all about how you use it. After my wife became pregnant with our first son and all the soul searching that ensued, I knew that my purpose in life had to be based on contributing to addressing some of the world’s social and ecological problems. I even toyed with the notion of running for political office, and maybe I will one day, but I realized that I’m never going to have the reach or impact I can have with Etsy, with the millions of people it gives us access to, and I knew that we could further our economic impact in people’s lives. If the primary purpose of our business was to have a positive influence in the world, if selling things and making money were by-products of that but weren’t what motivated us, how might we then use business as the tool to make that impact? And so I helped create a new mission statement for Etsy, which we still have today: Re-imagine commerce in ways that build a more fulfilling and lasting world. That’s what we want to do: completely re-imagine what business is and the purpose of business, and do that not in order to make as much money as possible but to build a world that is lasting, more sustainable, more durable from a social, ecological, and financial point of view and also is more joyful, more connected, more fulfilling. In 2012 something happened that I think is worth talking about. I don’t know how many of you know about PIPA and SOPA. To give you a little bit of background: On January 18, 2012, two bills were introduced in Congress that had bipartisan support and were expected to sail through both the House and Senate. One was called the Protect International Property Act or PIPA, the other the Stop Online Piracy Act or SOPA. They would basically give power to the government and others to stop online piracy in the motion picture and recording industries, which were strong backers of the bills. As written, however, they could have created tools for censorship of the Internet. In that one day, a number of big for-profit companies, although not super-well coordinated, very quickly organized to protest these two pieces of proposed legislation. Three million people emailed Congress in opposition to the bills; more than one million messages were sent through the Electronic Frontier Foundation to Congress; a petition at Google recoded over 4.5 million signatures; Twitter recorded 2.4 million SOPA-related Tweets; and lawmakers received more than 14 million names of constituents who contacted them to protest the bills. As a result, both bills were stopped dead in their tracks. No one wanted to touch them, and they’ve never been reintroduced since. SOPA was a bad piece of legislation, and it was good that it was rejected, but the point is that the response was so swift and successful that it made me realize how powerful a tool business can be, either for good or bad, depending on how it’s used. It has to be used in the right way. What does it mean to use business in the right way? A few years ago, as Etsy was becoming increasingly successful, I began to develop what I can only call a case of imposter syndrome. I was feeling insecure about what I was doing. Am I qualified to do this work? I never went to business school, so why are you here listening to me? Maybe it’s because you want to support the Schumacher Center, which is fine, but who am I? There I was, speaking at big marketing conferences, and I worried that someone was going to come up to me and say: “All right, buddy, the jig’s up. You’re out of here.” I was finding a lot of advertising morally questionable, even though I’m the marketing guy. I began to wonder if growing the company is really the best thing; maybe good business shouldn’t always be about growth, but I felt as though I didn’t have the authority to say such a thing. I was nervous even thinking it. At this moment of real insecurity I decided that I needed to get an MBA, even though it would mean spending my only free time away from my family and spending $70,000 on taking courses that I myself already felt equipped to teach because I had been learning by doing. Some of the material was morally questionable to me, but I went ahead because I needed the credentials. I don’t mean to put MBAs down. My brother, who is definitely the smart one in the family, has an MBA, and I’m glad our CFO has one or two, maybe even three, and she’s a lot smarter than I am. This is not a criticism of MBAs but rather a criticism of how we’re educating people and what we’re teaching them. I decided that if we’re trying to re-imagine commerce, to re-imagine how business is done, then I shouldn’t be learning how to do it like everybody else. Schumacher said this too. In Small Is Beautiful he wrote, “The perpetual state of crisis in which we find ourselves suggests that there might be something wrong with our education.” And I believe that’s true. For him the task of education first and foremost was to transmit ideas and values. He also wrote, “More education can help us only if it produces more wisdom.” Twenty years later David Orr echoed this sentiment in his Schumacher Lecture when he said, “The skills, aptitudes, and attitudes necessary to industrialize the earth are not necessarily the same as those that will be needed to heal the earth or to build durable economies and good communities.” Isn’t this what we are trying to do with Etsy—re-imagine commerce to build durable economies and good communities? So I asked myself, What are the skills, aptitudes, and attitudes that will get us there? As a first step, to echo Schumacher, we need to bring more wisdom to education. Business skills are certainly essential—you do need to know accounting and a few other business skills to be an entrepreneur—but I believe they should be supplemented by or secondary to courses in systems thinking, permaculture, ecological commerce, biomimicry, art, craft, authentic leadership, ethics, citizenship, nonviolent communication, community organization, a just culture, and mindfulness. These are the subjects that have been especially useful for me as I’ve been on my educational journey. I think we need to take education away from the wholly theoretical and move more toward the experiential. David Orr in that same lecture said, “Things like rivers are real, disciplines are abstract.” My whole education in business has been experiential; I just figure things out by doing them. I’ve made mistakes, but that’s okay. I often ask myself if mastery of Microsoft Excel matters more than mastery of one’s own mind through meditation. Will I learn more in a marketing class or walking in the woods? The answers to questions about business are in Schumacher or in Buddhism. Every time I think I have a great idea, I have to say, “Oh wait, that’s Schumacher” or “That’s Buddhism.” To quote Schumacher again: “An attitude to life which seeks fulfillment in the single-minded pursuit of wealth—in short, materialism—does not fit into this world, because it contains within itself no limiting principle, while the environment in which it is placed is strictly limited.” I quote all these people to show you that some very intelligent people have these same ideas. When it comes to business, Right View is a systems view, and as Otto Scharmer teaches us, it’s not an egosystem view but an ecosystem view. When I started re-imagining commerce, it occurred to me that we may not need to be looking to Amazon or eBay or other big businesses if we mean to do things differently; we may well need to be looking to nature. And when I asked myself what we can learn about business from looking at nature, I realized that there is an abundance of remarkable information right there for us to learn from. In thinking about the lessons we could learn from the nature of ecosystems when it comes to business, the first thing I find applicable is that it is both complex and distributed—like Etsy with its 1.2 million small businesses. A big number of small things rather than a small number of very big things turns out to be a highly resilient structure for business. If you consider agriculture today, sadly there are huge monocultures of corn or soybeans, for example, and if you drive across the United States, you see mile after mile of cornfields in places where there probably was once rich biodiversity. What has to happen in order to sustain that monoculture? More and more chemicals are pumped into the ground, more and more insecticides are used to keep those fields going, with the soils ever degrading as a result. What happens if there is a blight or an insect that likes to eat corn? Well, the whole system collapses, right? It’s not a resilient structure. Etsy runs a program called Craft Entrepreneurship, which partners with cities to do entrepreneurial education programs for underserved populations. We have them all around the country and one in the UK. We have one in Rockford, Illinois, and when we were establishing this program, I met a few times with Larry Morrissey, the Mayor of Rockford, and talked with him about his city. He told me there used to be hundreds of artisan furniture businesses there. What happened to them? Consolidation drove them out: big companies moved there, and people went to work for a small number of very big companies rather than a big number of very small ones. Then when a big factory leaves that town, the whole system collapses. It’s an important lesson in understanding the distributed, complex interactions of an ecosystem. Another characteristic of ecosystems is that they’re dynamic, always shifting and always changing. This is extremely important for entrepreneurs to emulate. Like ecosystems, businesses are always changing, and they’re always moving really quickly. I attribute my longevity at Etsy to the fact that I don’t hold on too tightly, that I am flexible, that I move with the energy and the flow because I recognize that things are moving. I find that those who get too caught up in identity or a fixed sense of “I am this person so I need to do this” are the ones who don’t last, and theirs are the businesses that don’t last. Ecosystems are patterns within patterns, big ecosystems made up of ever smaller ones, and this is probably one of the most important lessons you can apply to business. Using Etsy as an example, we are part of many ecosystems, both larger and smaller than we are. We are part of the business ecosystem that comprises all businesses but also of a smaller ecosystem of tech companies and smaller still of the ecosystems of New York businesses and Brooklyn businesses. In addition the ecosystem of Etsy is made up of the ecosystem of sellers and the ecosystem of buyers and the ecosystem of suppliers and the natural systems—systems within systems, down to the ecosystem of the teams at Etsy and of my team at Etsy, all the way to the ecosystem of me. My whole body is a system. Looking to ecosystems, we’re presented with a strategy that teaches us what we need to know to operate successfully—namely, that the most abundance exists at the connection point between two ecosystems. Think about the edge of a forest or an estuary, where you have the most biodiversity and the richest soil. Similarly, we create the most abundance for Etsy when I’m connected as the ecosystem of me—body, mind, and spirit—with my team, when I see that Katie’s success is my success and Will’s success is my success, and so on. Another connection point: we create the most value when we connect a buyer with a seller or when we connect two sellers as a team; those meaningful transactions are what makes Etsy special. Much of the work we do is really about trying to strengthen these connections because when we do, then we’re able to see the interdependence of all the different parts and make the decisions that create the most value for people and the planet. I want to quote Judy Wicks again because she knew this inherently. In her Schumacher lecture she said, “I attribute our success . . . to making decisions not for the sake of maximizing profits but instead maximizing relationships with our customers and staff, with our community, and with our suppliers and our natural environment.” Her emphasis on relationships is crucial. As I was preparing this lecture, I was reminded of Bill McKibben’s Deep Economy, which I mentioned earlier. In that book he said, “The key question will now change from whether the economy produces an ever larger pile of stuff to whether it builds or undermines community—for community, it turns out, is the key to physical survival in our environmental predicament and also to human satisfaction.” That is Etsy’s mission! Build community, don’t sell stuff. That’s re-imagining commerce as something lasting and fulfilling. That’s human satisfaction. Without even realizing it, Bill McKibben had written our mission statement in 2007. I want to end with one last thought that is a challenge of sorts both to myself and to all of you. If you consider the huge problems we’re facing right now—climate change, wealth inequality, resource scarcity, plastic islands in the sea, tar sands, fracking, loss of indigenous culture, waste—you’ll notice that all of them are connected. I hate to say it, but we are complicit in what has happened. We are part of it, and much as I want to put all the blame on Exxon Mobile and Monsanto and other huge companies, it’s the choices we are making as consumers that perpetuate the system and create these problems. We’re consumers of goods, consumers of time, consumers of food. To meet the challenge, I believe we all need to think more carefully about the choices we make as businesses, as individuals, as consumers. I’m not saying this to make anyone feel guilty, and I’m just as complicit as anyone else. I realize that there is a lot of pressure to continue to consume as much as we do. In fact, it’s made all too easy for us. Some of the smartest people in the world are dedicated to making it tempting and more convenient, and that is part of the problem. The other day my friend Palmer came up to me and said, “You’re getting rich.” I think he meant it sweetly, but he made me realize that I’m the product of the choices that I make everyday. We all make choices. We choose to eat one thing instead of another; we choose what we read, what we watch, where we go online; we choose to buy one item or another item; we choose to take the stairs or ride in an elevator, fly somewhere or stay put; we choose to engage with the world around us or stare into our phones; we choose to listen deeply or to be lost in thought. I say this because we need to spend more time thinking before we act. And maybe as both entrepreneurs and consumers we should pause and ask ourselves what choices we can make to strengthen the connections among, and create the most benefit for, all of the parts of this interdependent ecosystem. Then, by acting accordingly, we might begin to build a new system, one that creates far more value for communities and the planet than it takes from them. This is what I’m working to do in my personal life and with Etsy. It’s all about choices. The challenge that I give to myself and to you and to your businesses is to choose connection in everything you do and live in fragments no longer. I believe that consumers crave objects that are expressions of the makers’ soul, not just something cheap. One of the problems with creating a marketplace for crafts is that it encourages the artists to make things to be marketable rather than as expressions of their soul. I don’t think the two are mutually exclusive. I would hope that much of what artists are making and selling on Etsy does express their soul. It’s important to focus on telling the story of those who are behind the products; when we give more meaning to the marketplace in human terms, then the art that expresses the soul is marketable because it connects maker and consumer directly. There is no such connection if you order from Amazon, for instance. One of the challenges and opportunities for Etsy is to make sure that we’re always trying to connect buyer and seller and to strengthen the connection between them, because that’s how we’ll create the most value both for the makers and for those who are buying their goods. What obligation do big companies have? Well, on a very basic level they should stop thinking of nature as an externality. Most businesses are run as if nature is something we can exploit however we want. Big businesses have artificially low prices because they’re not accounting for what they’re doing to natural systems, so they need to be educated on the true costs of their goods, and this has to be coupled with educating consumers. I don’t think we can continue to build a system that’s based on low price and convenience. If we can educate consumers not to buy the cheap stuff because they understand what the true cost is, and if we can make businesses admit to the true costs of their products, then maybe we can bring about a shift in how we consume and produce. We’re still going to consume as a species, but we can consume less, buying things that are more expensive and last longer but buying fewer of them. This is the kind of shift we must make if we are to get away from a disposable society in which products are artificially cheap. Companies and consumers need to be educated to make decisions based on the true cost, not just financial cost. Etsy doesn’t contribute to politicians or political candidates, but we do try to influence them, I hope in ways that are good. An example of where we’ve been active is around net neutrality. It’s important to us because we believe losing net neutrality could have negative repercussions for our small businesses. We’ve been actively involved in attending meetings at the White House and with members of the House and Senate. Our goal is to protect small business owners, to protect the women who are running the shops on Etsy, and we advocate for them. I guess you could say we’ve been lobbying in a way—but for a good cause! We have one full-time policy person. I have to deal with my fear of doing what I know in my heart is right. There are people who will try to make you think you’re crazy for taking a different path. My advice is not to listen to them, to be unafraid, to try something different. I think we can all agree that the way we’ve done things so far is working out well for only 1% of the people in the world. Buckminster Fuller once said that real change doesn’t come from fighting against the system. It comes from a new system that renders the old one obsolete. I find that to be the right way to think. Rather than trying to tear the system down, let’s ignore it and try to build something better, something that we know in our hearts is better. Then others will come and join us. When a business like Etsy starts to become big and successful, of course people around the world see opportunity for economic gain. Many of us have the impression that everything made in China comes from a sweatshop and is therefore undesirable. This is not true. Yes, there are some bad apples in the bunch, and we have a whole team devoted to addressing that and proactively removing things from our site that don’t fit our policies; we have a whole team writing software that tries to keep bad stuff from getting on the site in the first place. It’s going to be a constant cat-and-mouse chase. We’ve been to China and met a lot of the sellers for Etsy because we wanted to understand the situation. It’s been fascinating to learn what’s behind many of the products; for instance, most of the people we met there were families working together. What I’m interested in doing is figuring out how to increase transparency. How do we tell the story about the people behind our products and help educate consumers to make right choices? To make the choice, for example, of saying, “I don’t feel comfortable about this product because I don’t know where it’s coming from, and I don’t know the social or ecological cost of how it was produced, so I won’t buy it.” This is a challenge for any company that’s growing. We always talk about how to grow big and stay small, which I think has a lot do with the mission, the vision, and the values of the organization. Our team tries to instill those values, that way of thinking, the right view of business into everyone in the company so that as a whole we can make decisions that create the most benefit for the people and the planet. I used to be worried about Etsy getting too big, but I know that we haven’t strayed from our mission, from our vision, and we haven’t jacked up prices or done anything unfair. Our growth is a testament to our 1.2 million small local businesses operating around the world. As long as we keep on track, I’m not afraid of getting big, but it is a challenge that needs constant attention. So much of economic development, especially on the municipal level, has to do with thinking in the old, broken-system way by saying, “How do we get that big Siemens factory here and create a lot of jobs?” Or saying, “If only we could get the Ford plant back again.” I don’t think those are solutions. What we want to do is give artists the tools for more self-sufficiency so that a big number of small things will be created. Take Rockford, take Detroit, take Cleveland, take Newark. and try to create more human-scale economies, to go back to Schumacher again. It’s a huge challenge, and there aren’t going to be solutions that fix the problems overnight, but I feel confident that Etsy can contribute to turning those cities around. We have Etsy teams, which are groups of sellers organized by geographic location. There is an active Hudson Valley team, for instance. We support each team with educational resources and grants. There are 300,000 team members around the world. We also have a craft entrepreneurship program, which includes working with local groups of Etsy sellers and training them to become teachers for underserved populations in their communities. This is a way we can scale these programs and still keep them based on real, in-person connections. It’s not just content on the computer. We’re at the size now where we should be having internal conferences, just to make sure we’re all thinking in the right way. We’d like to have one this year on the importance of place. Next year we’d like to have one on the places where we are located and how to become engaged with those communities, working with them to regenerate the towns and the natural systems that support them. We need to do more to change the way children are being educated. I’m interested on a personal level in how to do that. With a group of other families in our neighborhood, we have a co-op school, which takes a lot of work and commitment. There’s a certain amount of fear involved in doing something different and unusual, and that sometimes holds us back, but we need to be fearless if we are to try new things, to take that leap. I was with Michelle Long from BALLE yesterday, and one of the things she talked about was divesting from Wall Street. That’s scary because every financial person I know says, “But you need to be squirreling money away for your kids’ education.” I’m not sure that mine will be going to a four-year college, not one that’s $60,000, or maybe $200,000 by then. My thesis is that it comes down to choices. Charles Eisenstein’s The More Beautiful World Our Hearts Know is Possible is a wonderful book because it’s about listening to your heart and trying to make the right choices to build the world you know is possible. I mentioned Larry Morrissey, the mayor of Rockford, Illinois. Our craft entrepreneurship program actually started when he reached out to us and said: “You’re talking about building an Etsy economy. Why don’t you do it in Rockford? What does it actually look like?” Something he said has really stuck with me. “It’s not just about money; it’s that no one is coming to save us. We have to do it ourselves.” He’s not expecting help to come from Democrats or Republicans. I find him to be a forward-looking mayor who’s saying we need to take the tools and do the work ourselves to build the city we want to build. That’s why we decided to teach people to be entrepreneurs, to try to embed the entrepreneurial spirit in people. One of the problems, though, is that it’s hard to be an entrepreneur. Not everyone is going to be successful at it, not everyone is going to have a great idea for products, so we need to ask what other skills people have. We also need to help people think locally in a lot of ways so that they build community through commerce but also through time banks, through co-ops, through sharing, through connecting. How might we support the businesses in a local community that are successful? Might we help to form co-ops where people share in the making of things? This can then be another way to strengthen the local community and create economic opportunity for those who may not be the most entrepreneurial. It does come back to place and local connections, and that’s where churches can be a part of this too by providing the physical space, a place where people meet and connect. I think Caroline is going to talk in her lecture about the importance of artists having a connection to place, putting roots down, looking at ownership structures and rethinking how spaces are owned, how they can become more tied to the communities that really need them and the people who live there. I keep coming back to the importance of connection and connecting people in order to create a community. According to the Small Business Administration a small business is one with 500 or fewer employees. Etsy has already exceeded that number. I think back to the kid on our poster who was throwing a rock at the factory, which was the way I was thinking at that time. My thinking has evolved since then. The sentiment is still the same, but it’s not about a specific number of employees; it’s about building a business of appropriate size, and it’s hard to assign a number to what makes a business small. For me, it stops being small when you don’t know all those who are involved in the production of a product, when you can’t actually understand where all of the pieces came from, who is doing what and how it’s being done—then it’s too big. As long as you know the role that everybody plays in the creation of a good, then that’s appropriate size. I remember when I was in Germany I read about a sweatshop in Spain that was making clothes for a clothing brand. The owners weren’t even aware of the working conditions because the factory was run by a subcontractor of a subcontractor of a subcontractor. That’s what I call disconnection. I’m not someone who believes that technology is going to save the world. I believe community will change the world. But technology is certainly a powerful tool for connecting people and organizing them quickly. Think about the proposed PIPA and SOPA legislation I mentioned earlier. In a single day millions of people were connected and motivated to act, which shows that technologies can serve a community and help it organize. There are resources on the Schumacher website to guide you and also on the website of another organization I’m involved with, The Center for a New American Dream. It has everything you need to know about setting up a tool library, setting up a seed library, tools for connecting people locally. Start small. Take one step by doing one thing, perhaps cleaning up a park, which may enable the community to take more control of the commons and to build a commons together. There is a tension between local and global, but there is a lot we can do to use Etsy as a tool to better support local community. For example, we just launched a product that allows people to accept payments in person. We’re also considering introducing same-day delivery, but not same-day delivery Amazon style, which is to send a drone to your house and cut out people completely. Amazon says, “We can get you this book more quickly, more cheaply than your local bookstore, so why would you want to go there?” What we would like to say is: “Oh, you’re in Manhattan; I’m in Brooklyn. There’s an independent coffee shop midway. Let’s meet there.” Because people are increasingly interacting with the internet through their mobile phones, local has become a central focus for Etsy, which includes better supporting the local teams and communities we have. There is a way to reconcile some of the global-local tension. I have a dream that may someday become a reality: I’m in Brooklyn, you’re in Spain, and you like my t-shirt. Instead of my printing it, packaging it up, and sending it to you, I email the design to a printer who’s your neighbor. That way we have a global and local transaction at the same time. As a company we need to understand Etsy’s place in its communities and pay attention to where it’s placed: London, Paris, Berlin, Brooklyn, Hudson. What is our interaction there with those communities? Are we a good business, a good neighbor in those places? There are hundreds of communities on Etsy, and there’s not just one Etsy community: there’s the Brooklyn community, the Hudson community, etc., and we can use technology to connect them all. As I said earlier, business is a tool, and Etsy is a tool. It’s a platform that can be leveraged and can be used to strengthen local communities. First of all, thank you, Caroline, for your lecture. I’m so impressed by what you’ve already done and eager to see all that you are going to do. The theme that’s been coming through for me today—both in Caroline’s presentation and in my thinking as I prepared for my own presentation and also in the questions that have been asked—is education and the crucial role it plays. I for one believe there will be a revolution in how we educate people and in what we teach them. I am excited to help make that happen. There are really smart people with a lot of wonderful ideas out there, probably coming from many of you in this room. We have to make these ideas accessible to others and find partners like Judson Church to bring people together to discuss and learn to share these ideas. We don’t need to pay money to do that. In conclusion I’ll go back to the Buckminster Fuller quote I mentioned earlier, to the idea of not fighting the existing reality but making a new one that renders the old one obsolete. I believe it can be done—if we make up our minds to it—and many of us are already choosing that path.